They are Catholic blogger Paulus Le Van Son, and of the Protestant leader Nguyen Van Oai. The pair were arrested without a warrant, and during the trial their legal assistance was restricted. In recent months they were pressured by the authorities to extort a confession. Other dissidents still in prison. 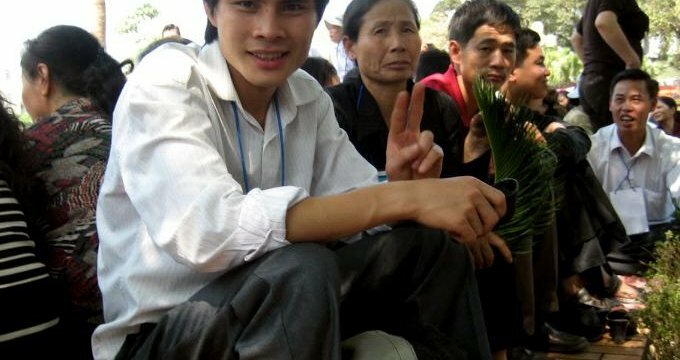 Hanoi (AsiaNews) - The Vietnamese authorities have released two Christian activists after having served the full term of the sentence imposed on them in trial. The are the well-known Catholic blogger Paulus Le Van Son, and the Protestant leader Nguyen Van Oai, at the forefront in the defense of social rights. The two were released from prison in recent days, after having undergone a sham trial often used by the authorities and the Communist Party to target dissent. Arrested in August 2011 during a series of raids against bloggers and human rights activists who had links with groups and religious organizations, environmental groups and anti-Chinese patriots, Le Van Son and Nguyen Van Oai were taken to a Hanoi prison. Both were given a sentence of four years and four more on probation for trying to "overthrow the legitimate government" based on the controversial article 79 of the Vietnamese Penal Code. The pair had been arrested without a warrant and during the trial were not given recourse to adequate legal assistance. Speaking to Radio Free Asia (RFA) after their release, Van Oai states that in recent months he was subjected to repeated pressure to sign an act in which he pleaded guilty. Once signed, the guards said he would be released. Later, they were asked to write a personal confession. However, he always refused and continued to profess his innocence. However other activisits such as Dang Xuan Dieu and Ho Duc Hoa, arrested during a Hanoi crackdown in 2011. They must serve 13 years in prison, the most severe penalty imposed on members of the movement. The story of Paulus Le Van Son - such as those of Le Quoc Quan, Cu Huy Ha Vu and dozens of other jailed bloggers and activists, shows how Communist leaders in Hanoi regularly use an iron fist against domestic dissent. The authorities have also targeted Buddhist and Catholics religious leaders, as well as entire communities. Last year for example, both media and government launched a smear campaign and targeted attacks against the local bishop and Catholics in the diocese of Vinh. Repression also affects many individuals, who are penalised for claiming the right to religious freedom and respect for citizens' civil rights. According to the activist international movement Human Rights Watch (HRW) currently there are between 150 and 200 bloggers and activists detained in Vietnamese prisons, guilty of having wanted to exercise (and defend) basic human rights. Hanoi frees two Catholic activists, four years in jail for "anti-government activities"